Yes, yes, yes ….I am in the midst of a major nesting extravaganza. The directions were a tad bit complicated and the supply list was a lot overpriced for me. But I still really, really wanted to make this project so I pondered it and came up with an easier and cheaper alternate. 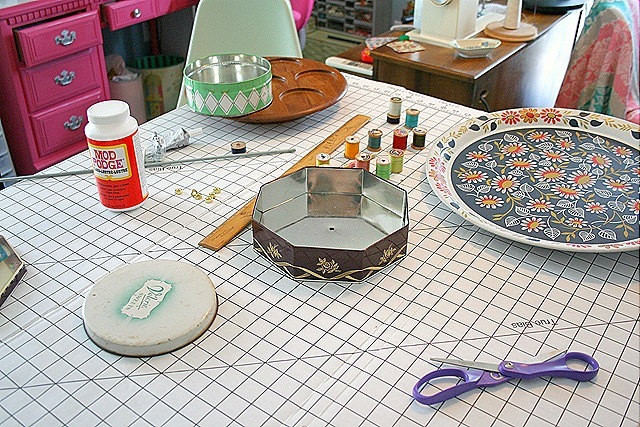 Here is my "sewing studio" version. The supply list is here, everything is pictured above. Remember everything is thrifted or re-purposed. I only purchased the threaded rod and the hex nuts and washers. OK, my directions are going to be specific to making a three tired organizer just like mine. Modify as you see fit. I found the center for the tray, lazy susan, and the tins and then pre-drilled a hole in each. Next I inserted the threaded rod in the lazy susan and then added some glue before sliding the tray over the threaded rod. Next I secured the rod with a washer and hex nut. Now, to cover the threaded rod and add stability I used vintage spools of thread. Before sliding them over the rod I painted them with Mod Podge to give them a finished look and secure the thread on the spools. After adding the spools of thread then I added another washer and hex nut then I added the next tin. I continued with a washer and hex nut then more spools. Next came another washer, hex nut and then the third and smallest tin. Another set of washer and hex nut then more spools. 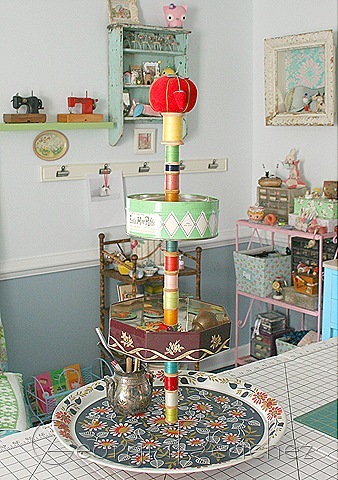 I topped it off with a larger spool and then a vintage tomato pin cushion. We carried some of these at the shop, but this is so much cooler than any we EVER had! I love it! Are you going to make some for your etsy shop?? That is the CUTEST PROJECT! Now I need to hunt down some tins to do my own version. Adorable! Love this!!! Already decided it has to be a project for my pal Alice and me soon!!! Absolutely wonderful!! Good for you, you creative thing you! That is so freaking adorable. My mom is setting up her new sewing studio and this would be perfect to hold some of her notions!! I’m going to forward her a link to your blog so she can see for herself! Speechless. It’s amazing and wonderful. This turned out GREAT! Bravo!! You are one crazy crafty gal. I LOVE IT!!! Love it! Way more cool than a purchsed item! Pretty and functional…gotta love that. Hi…Thank=You So Much for Sharing this Project…I have been wanting to do this with my Decoupaged Tin Cans and had No Idea how to go About it…Now I think your “Sewing Tier” would work for my Cans as well…I will send a pic when I finish it! Thanks Again…You are One of the Craftiest Crafters I know! WOW…!!! Can’t wait to see your finished Craft Room and Other Projects! AWESOME IDEA!!! Wow, that’s just tooooo cute!! I love it! Now you really need to send that idea in to a magazine or something…more people would love to make one than just little ol’ bloggers out here!! Absolutly the cutest thing I’ve seen! Love, love this! Too darn cute! Just shared this link on my Facebook page! I saw something similar in a magazine years ago and I could never for the life of me figure out how to do it, I tried, but the results were a disaster. Yours is so much cuter too! I am so making one of these after the holidays die down. Visiting from Roadkill rescue. BTW I host a link party at redoux.blogspot.com every weekend. I would LOVE it if you could stop by and link up this project. This is just fantastic and I know a lot of people will love this. Thanks!